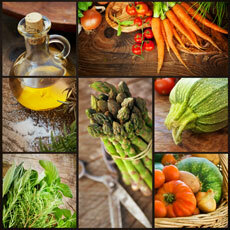 October 2012 - Seven Countries Study | The first study to relate diet with cardiovascular disease. Among regular consumers of alcoholic beverages in the Zutphen Study, average alcohol intake increased from 8 g/d in 1960 to 18 g/d in 1985 and then decreased to 13 g/d in 2000. 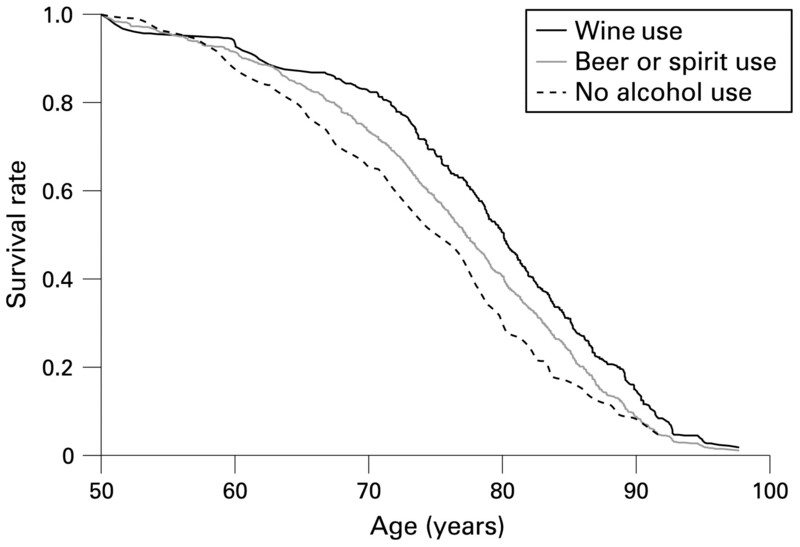 All-cause mortality during 40 years of follow-up was 25% lower in men who drank less than 20 g alcohol per day and on average 6 g/d compared to non-drinkers. Men average aged 50 with a long-term regular alcohol intake of 20 g/d or less, had a 2.3 years longer life expectancy than those who did not use alcohol. The life expectancy of wine drinkers (average age 50, average alcohol intake 2 g/d) was 4.7 years longer compared to those who did not use alcohol. For those who consumed on average 8 g/d alcohol as beer or spirits the difference in life expectancy from non-alcohol drinkers was 2.2 years. The Zutphen Elderly, HALE and FINE studies researched the indicators of healthy ageing. Smoking was associated with all-cause mortality after 10-years of follow-up in all cohorts of the Seven Countries Study except the Japanese, apparently due to the small number of events in Japan in the early follow-up. 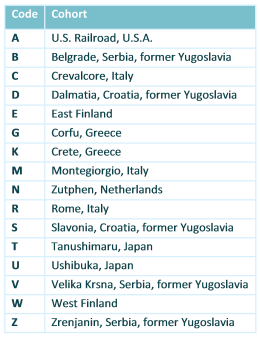 The strength of this association was stronger in the cohorts from the US and northern Europe than in the eastern and southern European cohorts. After 25 years of follow-up, in contrast, smoking was associated with a higher all-cause mortality in all 16 cohorts. For example, the 40-year follow-up data from the Zutphen Study showed that smokers had a 60% higher all-cause mortality compared to non-smokers. In the elderly men of Finland, the Netherlands and Italy, the 10-year all-cause mortality was 67% higher in smokers than in non-smokers. Men who stopped smoking at age 40 had 4.6 year greater life expectancy, while men who stopped smoking at age 70 had an addes 2.5 years. Life expectancy at age 40 was 6.8 years shorter for cigarette smokers compared to non-smokers and 8.8 years for men who smoked more than 30 cigarettes per day. 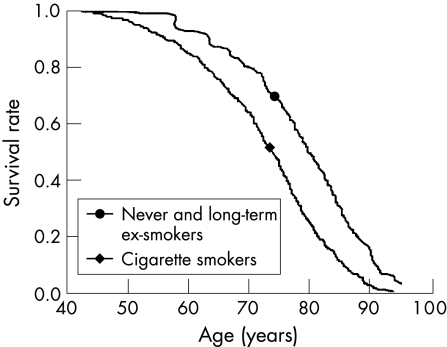 Exclusively cigar or pipe smokers had a 4.7 year lower life expectancy. Elderly men in Zutphen with a high level of leasure physical activity (mean 1217 min/week) had a 23% lower all-cause mortality after 10 years of follow-up compared to those with a low level (mean 122 min/week). Men who walked or cycled at least 3 times per week for 20 min or more per day were called active and those who did not meet the criterion were considered sedentary. All-cause mortality was 29% lower in the active compared to the sedentary men. Changes in physical activity over the period of study were also related to all-cause mortality rate. Men who were sedentary in both 1985 and 1990 surveys had a 2 times greater risk of death from all-causes by 1995 compared to those who were classed as active in both surveys. A gradient of decreasing risk of death was observed among those who became active compared to those who became or remained sedentary. In the Zutphen Elderly Study physical activity was assessed with a questionnaire among these retired men, which queried about frequency and duration of walking, cycling, sports, gardening, hobbies and odd jobs. The questionnaire was validated against measures of total energy expenditure. A Healthy Diet Indicator (HDI) score was calculated based on the 1990 Guidelines of WHO on prevention of chronic diseases for men aged 50-70 from Finland, The Netherlands and Italy. The 20-year all-cause mortality was 13% lower in the group with the highest compared to the lowest HDI. In the HALE project the Mediterranean Diet Score (MDS) was associated with a 18% lower and the Mediterranean Adequacy Index (MAI) with a 17% lower 10-year all-cause mortality. The MDS and the MAI were both based on foods characteristic of the traditional Mediterranean diet in the 1960s. 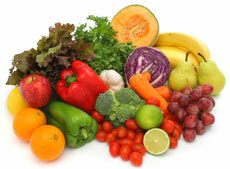 Within these dietary patterns, grains, fruit and fish were most strongly and inversely related to all-cause mortality. All three scores indicated that a healthy dietary pattern is associated with a lower all-cause mortality. The median total lignan intake in elderly men in Zutphen was 977 microgram/d. The intake of the lignan MAT (matairesinol) was significantly inversely related to 15-year fatal CHD – in contrast to the total lignan intake which was unrelated. The inverse association between MAT and CHD mortality could be due to an associated factor such as wine consumption. Lignans are diphenolic compounds present in plant foods (and not to be confused with lignin, one of the dietary fibers). We studied the lignans LARI (lariciresinol), PINO (pinoresinol), SECO (secoisolariciresionol) and MAT. These molecules are converted to enterolignans by the intestinal microflora and possess estrogen-like activities. We developed a method to measure the four lignans in foods and beverages. The most abundant lignan sources are flaxseed and sesame seeds. In the Zutphen Elderly Study most of the lignans came from tea, vegetables, bread, coffee, fruit and wine. Adhering to a Mediterranean style diet was associated with a 39% lower coronary mortality risk and a 29% lower cardiovascular mortality risk in middle-aged and elderly European men and women in the HALE project. The Mediterranean diet score we used was based on eight basic food groups: bread, legumes, vegetables, fruit, fish, fats, dairy products and meats. A high intake of bread, legumes, vegetables, fruit and fats rich in unsaturated fatty acids, a moderate intake of fish and a low intake of dairy and meat was characteristic of a Mediterranean diet. The HALE project dealt with European elderly men and women participating in the FINE and the SENECA Studies. They were 70-90 years old at baseline and were followed for 10 years. In both studies the dietary history was recorded as the measure of habitual food consumption. 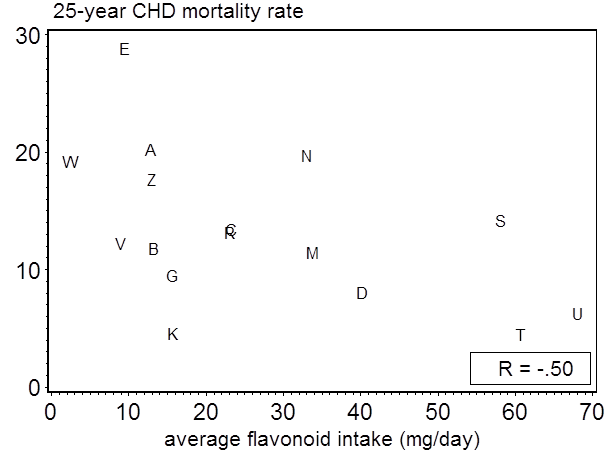 High cohort flavonol intake related to low CHD mortality rates. [/glossary_exclude]The average flavonol intake varied in the 16 cohorts of the Seven Countries Study between <10 mg/day in the rural Finnish and >60 mg/day in the rural Japanese cohorts. After 25 years of follow-up the CHD mortality rate was 6 times higher among farmers from Eastern Finland compared to those in Japan. The average cohort flavonol intake was significantly inversely associated with 25-year CHD mortality rates. Information on the average food intake of the 16 cohorts was obtained in the 1960s, and the average flavonol intake was determined chemically in representative food composites. The most common flavonol measured was quercetin. Flavonols are a subclass of the flavodnoids, an extended class of chemically related compounds ubiquitously present in plant foods. In a range of experimental models, these compounds have demonstrated biological effects, which may partially explain the beneficial health effects of a diet high in vegetables and fruits. Flavonols are present in tea, apples, onions and red wine. High intakes were observed in Japan due to a high consumption of tea, in Slavonia (Croatia) due to a high intake of onions and in Dalmatia (Croatia) because of a high intake of red wine. Three factors combined – saturated fat, flavonoids and smoking – account for 90% of the differences in 25-year CHD mortality rates among the 16 cohorts in the Seven Countries Study. In univariable models average saturated fat intake at baseline was strongly associated with CHD mortality, while average flavonoid intake was inversely related. The prevalence of smoking at baseline was not related to CHD mortality rates. However, multivariable modeling showed that saturated fat and smoking were positively and that flavonoid intake was inversely related to CHD mortality rates. Based on mechanistic studies confirming these associations we conclude that saturated fat increases the cholesterol rich LDL-lipoprotein fraction and the risk of atherosclerosis. Smoking promotes LDL oxidation that might be offset by the strong antioxidant effects of flavonoids. Trials showed that replacing saturated with polyunsaturated fat reduces CHD risk. Prospective cohort studies found that stopping smoking and a high intake of flavonoids are associated with a lowered CHD risk. These results found at the population level in the Seven Countries Study are thus in agreement with those obtained in experimental and prospective cohort studies, strenghtening the interpretation of cause and prevention. Different results for saturated fat, serum cholesterol and CHD in the Zutphen and the Seven Countries Study. In 1960 the average saturated fat intake of the middle-aged men in Zutphen was high and amounted to 18% of energy with a relatively small standard deviation of 3% of energy. Dietary saturated fat was not associated with serum cholesterol and 10-year CHD mortality in the Zutphen Study. But in contrast, among populations of the Seven Countries Study showed that the average saturated fat intake, average serum cholesterol level and 10-year CHD mortality rates in the 16 cohorts were strongly correlated. The strong correlations of population levels of dietary saturated fat and serum cholesterol with CHD mortality in the Seven Countries Study overall was due to large variations in average saturated fat intake, average serum cholesterol level and CHD mortality rates among the 16 cohorts. In the Zutphen Study saturated fat intake of individuals was not related to either serum cholesterol or CHD mortality. 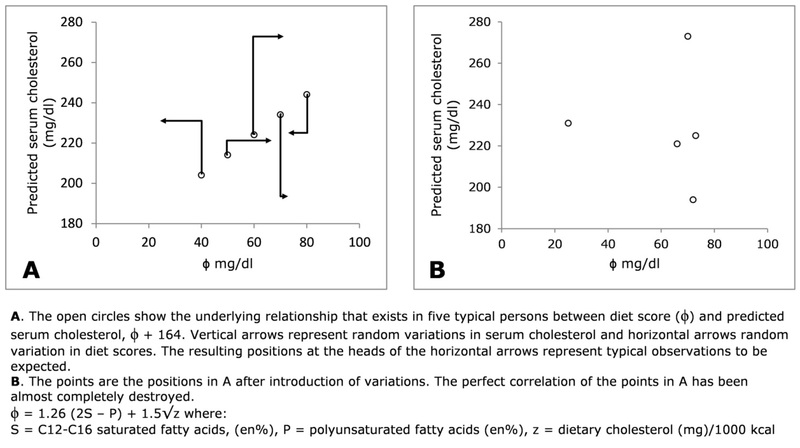 The zero correlations were the consequence of a small range in dietary saturated fat among the Zutphen men along with the large day-to-day variation within these men (see the graphs and Jacobs et al 1979).